What’s the Difference Between a Solar Cell, Module, Panel, and Array? I should probably start a solar energy glossary that covers this. The subject is totally confusing to newcomers to solar energy, especially when people first learn that there are different kinds of solar panels. I am going to attempt to break this down into the simplest components to tell you the difference between solar cells, modules, panels, and arrays for each type. One way that you can refer to virtually all types and be correct is to call them “collectors,” so I will use that as a generic term. All solar collectors gather solar energy in one way or another to “collect” solar energy for use. Solar electricity is what most people first think when we talk about “solar panels,” so we will start with this type of solar collector, which is also the most complex and controversial when it comes to the differences. Now that we have that subject out of the way, we can turn to something that is far, far simpler. Solar pool heating has a pretty established vocabulary with less variation and debate. Solar water heating is easy like solar pool heating. 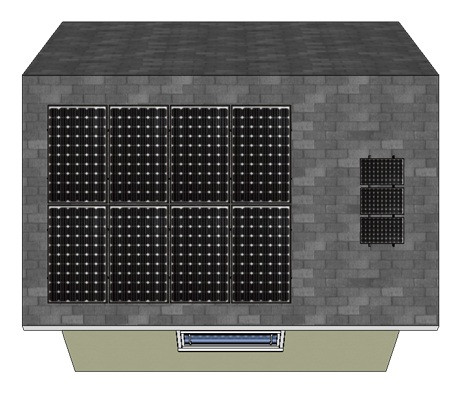 In fact, usually there is just one solar collector on the roof in a household system.